2009 was indeed a tale of two trends in U.S. law enforcement fatalities. Fewer officers died in the line of duty in 2009 (124 as of yesterday) than in any year since 1959. However, the number of officers who were shot and killed surged 23 percent this year, driven in part by five separate incidents in which multiple officers were gunned down by one offender. Those are among the key findings of a new report released today by the National Law Enforcement Officers Memorial Fund, in conjunction with Concerns of Police Survivors. Nearly one-third of this year’s 48 firearms-related fatalities—15 deaths in all—occurred in just five incidents in which more than one officer was shot by a single gunman. These tragedies took place in Lakewood, WA (4 deaths); Oakland, CA (4); Pittsburgh, PA (3); Okaloosa County, FL (2), and Seminole County, OK (2). 2009 saw the most multiple-fatality law enforcement deaths since 1981. The law enforcement heroes who made the ultimate sacrifice in 2009 came from 35 states and Puerto Rico. For the third year in a row, Texas, Florida and California had the most fatalities—a combined figure of 28, or 23 percent of the national total. Six federal law enforcement officers died in 2009, including three special agents with the Drug Enforcement Administration who were killed in an October helicopter crash in Afghanistan while conducting counter-narcotics operations. The average age of the officers killed this year was 39; they averaged 10.5 years of law enforcement service. All but one of the officers killed this year were men; the one female was Officer Tina Griswold, one of the four Lakewood (WA) officers ambushed in November. By contrast, nearly 10 percent of the officers killed in all of 2008 were women, the highest percentage in history. 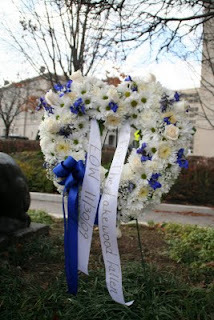 Read the full NLEOMF Research Bulletin at www.LawMemorial.org/ResearchBulletin, and leave your comments here. Footnote: Sadly, just hours after the preliminary 2009 report was released, we learned of the latest law enforcement death of 2009: Pierce County (WA) Deputy Sheriff Kent Mundell succummed to gunshot wounds he suffered on December 21 as he and another deputy responded to a domsestic disturbance call in Eatonville. He is the sixth officer from the Seattle/Puget Sound area to be gunned down in just the past two months -- a shocking spate of violence against law enforcement. It's known as the North Hollywood Shootout: two heavily armed bank robbers wearing military-grade, bullet-resistant body armor confronted police in a fierce, 44-minute gun battle in Los Angeles on February 28, 1997. A total of 10 officers and a half dozen citizens were injured before the gunmen were killed. The incident prompted the California Legislature the next year to enact a law prohibiting convicted felons from owning body armor as a way to help protect law enforcement. Last week, the 2nd District Court of Appeal in Los Angeles overturned the law, saying its definition of body armor was unconstitutionally vague. "It just makes this job that much more dangerous," Paul Weber, president of the Los Angeles Police Protective League (LAPPL) told the Los Angeles Times. "It's going to make criminals more bold and more likely to shoot it out with the police." Mr. Weber said the LAPPL, which represents almost 10,000 officers, will ask the state attorney general's office to file an appeal, which could prompt a review by the California Supreme Court. Read the full story in the Los Angeles Times: http://www.latimes.com/news/local/la-me-body-armor20-2009dec20,0,5869498.story. Saturday, December 12, 2009, at 8:14 am, more than 100 people were waiting in line at the Forza coffee shop where the four Lakewood (WA) Police officers -- Sgt. Mark Renninger and Officers Ron Owens, Tina Griswold and Greg Richards -- were ambushed and killed only 12 days earlier. The people were in line not just to buy coffee but to honor the memory and sacrifice of the officers and to formally re-open the store. Inside the store, a poster with pictures of the four officers, along with Seattle Police Officer Timothy Brenton, who was killed on October 31, 2009, in Seattle, was proudly displayed on the walls. The shop re-opened with support from the Lakewood Police Department and the officers' families. Lakewood Police Chief Bret Farrar was first in line and felt very strongly that the shop should re-open because, "You can't let the bad guys win." To read the full article from the Seattle Times, please visit: http://seattletimes.nwsource.com/html/localnews/2010494733_coffeeshop13m.html. The Lakewood Memorial Service was held on December 8, 2009, in the Tacoma Dome in Tacoma, WA. There were more than 2,000 officers in the official procession and over 20,000 people at the Dome, with hundreds of other indivduals attending viewing ceremonies at other sites. Pictures from the ceremony are available at: http://seattletimes.nwsource.com/html/photogalleries/localnews2010453392/13.html. On December 7, 2009, Oregon State Police Senior Trooper William Hakim and New Mexico State Police Lieutenant Michael C. Avilucea's names were formally added to the National Bomb Technician Memorial in Huntsville, AL. Over 150 friends and family attended the ceremony. Senior Trooper Hakim was killed on December 12, 2008, by an explosive device at a bank that also killed Woodburn (OR) Police Captain Tom Tennant and seriously injured Police Chief Scott Russell. Senior Trooper Hakim left behind a wife, Terri, a 19-year old daughter and a 17-year old son. He was 51 years old and was an 11-year OSP veteran. Lieutenant Avilucea was also 51-years old. He was killed in a vehicle crash on his way from an explosive recovery assignment on May 30, 2008. The names of these fallen heroes were added this past spring to the National Law Enforcement Officers Memorial in Washington, DC. There are now 15 fallen bomb specialists on the Bomb Technician Memorial. To view pictures from the Memorial and the recent ceremony, please visit: http://www.oregon.gov/OSP/NEWSRL/news/12_11_2009_hdsmemorial_hakim.shtml. In August 1984, U.S. Capitol Poilice Sergeant Christopher S. Eney died in the line of duty. Vivian Eney Cross recently shared her insights into the 25th anniversary of her husband's death and how the National Law Enforcement Officers Memorial ensures her husband's sacrifice will never be forgotten. The following article from the November 2009 edition of the Simulcast Newsletter, a publication of the Fraternal Order of Police District of Columbia Lodge #1, is reprinted with their permission. On August 24, 1984 my husband, Sgt. 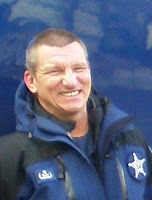 Christopher S. Eney died in the line-of-duty. At the time of his death, we had been married 12 ½ years and had two daughters, Shannen & Heather, 11 & 9 years old. This year was going to be the 25th Anniversary of his death. The girls and I had been talking on and off as to what we felt we should do to honor this milestone in our lives. We had no idea what was waiting for us. Early in the summer our liaison officer with US Capitol Police, Doug Shugars called and said that they wanted to participate in whatever we choose to do. We decided to have the service at the National Law Enforcement Officers Memorial. The service we had at the gravesite 25 years ago was beautiful and honorable, but the grave only acknowledges the death. We wanted to celebrate who he was and what he stood for – and that could only be done at the Police Memorial. The Memorial is where his service is acknowledged – it is also where his sacrifice is honored. About 35 family members gathered at USCP Headquarters on Aug. 18th. We then boarded a police bus and they took us lights and sirens to the National Law Enforcement Officers Memorial. I was to find out later that the department had coordinated with Metropolitan Police for our travel through DC. Once at the Memorial the center had been set up for a lovely service. The service allowed not only the Chief to speak and staff from the Memorial to speak; the girls and I were given the opportunity to speak. Finally the girls had a chance to stand before their law enforcement family and let them know how much the officers had come to mean to them – but also express to them what all these years standing by our side had meant to them. As the service ended, roses were given to us and to the grandchildren. (Shannen has a set of triplets and a set of twins, Heather has a set of twins and a newborn) How touching it was to watch the grandchildren place their roses on the wreath. After the service the family was given the time to do some rubbings of his name and talk to the officers who had joined us that day. The extraordinary day was finished with a reception. There the girls and I were given citations from Congress and the Department’s highest award, given to Chris posthumously. At the reception hall two poster-sized pictures of Chris were on display and all who were there that day signed them and they were given to the girls. If any of you have ever wondered if all the effort to build the Police Memorial was worth it – wonder no more. I wish everyone could have watched those little 3-5 year olds as they placed their flowers for a Granddad they never knew and so slowly and so carefully did their rubbings of his name. Their day was filled with awe and wonder and anyone who asked them were told, “My Granddad died and he was a policeman and he was special.” Patriotism and inspiration were born in them that day. As my daughter got home with her 5 year old triplets and set about getting dinner ready, she happened to look up and see the three boys marching around the room like the honor-guard did – they took great pains to stand straight, shoulders were back, heads were high and not a word was spoken – they were reliving a very solemn moment – it was etched in their hearts for all of time. The Memorial gives to Police Families what it so desperately needed – a place of honor, a place of remembrance, a place of beauty to come and walk the paths and touch the names again, and again, and again! Thank all of you for all your work in making this Memorial a reality. It is so special – it is Law Enforcement’s Hollowed Ground – and will be there for the next generation of heroes! To view read more about the 25th Anniversary Wreahtlaying in honor of Sgt. Eney, along with photo and video, please visit: http://nleomf.blogspot.com/2009/08/25-years-later-saluting-fallen-hero-and.html. Pamela Cei Brisky, a former traffic safety coordinator who worked with the police in the Seattle-Tacoma area, reached out to Kevin Morison, NLEOMF's Senior Director of Communications, to pay her personal respects to the four officers from Lakewood, WA, who were killed in the line of duty on November 29. In addition to writing the following tribute, Pamela also ordered a wreath in honor of the officers, which was placed at the Memorial on the same day as their memorial service in Lakewood. I moved to the DC Metro area from Washington State in 2006. While I lived in Washington State I worked as the DUI/Traffic Safety Coordinator for Mason County out of the Shelton Police Department. I was a civilian employee whose role was to act as an inter-agency coordinator between the municipal, county, tribal and state agencies. Officer [Tina] Griswold made her start at Shelton Police Department. By the time I came on board, she was with the Lacey Police Department. My friends who remain at the PD and those who have scattered have shared stories of a funny, sharp, spit-fire of a person. She has been, best as I can tell, remembered with as many smiles and with as much laughter as she has with tears. Shelton is a tiny agency and the Puget Sound area is a small community. You have but to tap a shoulder of a stranger to find someone who had either grown up with, gone through the academy along-side, or worked with one of the fallen Lakewood officers. In that area there are probably two to three degrees of separation. I frequently rode with our county's agencies as well as those (on occasion) in Thurston and Pierce Counties and met so many great people who remain friends. So, in answer to the "Why?" I have a thousand answers. I guess I would say in a place like where we lived no one was a stranger or remained one for long. But, mostly, I would say that as a former citizen having lived under their watch, I wanted to say "thank you." "In valor there is hope." This happens to be my favorite quotation and the most aptly chosen for the NLEOMF monument. Heroes bring us hope and inspire us to bring out the best in ourselves as citizens. I am the child of a police officer. My parents were (ironically) killed coming back from a police Christmas party a week before Christmas by a drunk driver. While my father (or mother) was not killed in the line of duty, I understand the loss the families feel on some level, of having someone taken so senselessly and so unexpectedly. I dread what lies ahead for them. We always talk about our fallen officers (and soldiers) paying the ultimate price, but it is the survivors that bear the Hero's burden. I guess I just wanted something tangible here, far away, to say that none of them are forgotten - and probably, selfishly, to feel like I did something small to say that I care for everyone who is back there dealing with this first hand. My brother wrote my parent's epitaph that appears on their headstone, "The example you have set through the lives you have lived has provided us with the goals and guidance for our own. Until we are joined together again, you remain in our hearts. Eternal Thanks." In my own personal case, that was my hero's goodbye and it is one said too soon to Officers Griswold, Owens and Richards and Sergeant Renninger. "Law enforcement officers are people like anyone else. They have families and personal lives, but they place their lives at risk in the line of duty to protect the communities in which they live and serve. The lives of these officers meant something. They did not deserve to die while sitting at a coffee shop planning for their shift that was about to begin, and they did not deserve to die because they were visibly uniformed police officers. The monumental loss that has been sustained by this shocking episode impacts us all and reminds us that life is truly precious and should never be taken for granted."